If you have a toddler at home, you know how busy they are. Your job as parents is to protect your childlren from danger and hazards around the house that could cause injury. It’s important to ensure that every room in your house is adequately childproofed. Since the kitchen and bathroom are likely to have the most hazards for young children, this article will focus on those two areas. These tips are sourced from CanadianLiving.com. You may prefer to keep treats away from your toddler but, if she knows where you keep them, she may try to get at the hidden stash when your back is turned and hurt herself. Choose a cupboard that’s far from the stove and that doesn’t require climbing to reach. Whenever possible, use the back burners of the stove for your cooking and turn pot handles inward so that a toddler can’t reach them. If you have a chest freezer, keep it locked and hang the key out of sight. Children attempting to reach into a deep freezer to retrieve a Popsicle may fall in head first. Keep small appliances away from the sink. A child leaning over a sink to wash his hands may inadvertently knock the appliance into the water and get a shock. Keep your toddler’s high-chair away from sources of heat, curtain cords, tables, plants, countertops and people traffic. Keep knives and food-processing implements in a separate latch-locked drawer, away from other utensils. Keep all cleaning products locked away and in the original containers with the information about their contents. Don’t keep foods in the same location as any poisonous substances. Put a lid on the garbage can. Lock the trash compactor. Tie dry-cleaning bags in a knot before discarding them; if recycling empty plastic grocery bags, store them out of your child’s reach. If you purchase a new dishwasher, choose one with an interior lock, which will prevent a toddler from opening it mid-cycle. Keep the detergent locked up with the other kitchen cleaners. Keep flammable items such as paper towels on a holder, and store pot holders or dish cloths away from a heat source. Install sturdy safety latches on all cupboards and drawers. Place a fire extinguisher on the wall in the kitchen away from the stove. Most household water heaters are set between 50 and 55C (122 to 131F). Lower the water heater’s temperature to 48C (118F), hot enough to kill bacteria, but not so hot that it can burn tender skin. A child this age still lacks the reflex to hold his breath when his face is under water. Although you may no longer need to keep one hand on him in the bath, don’t leave him alone. Don’t fill the bathtub more than a few centimetres; a child can drown in as little as 4 cm (1.5 in.) of water. Even leaving a child alone while the water is draining is dangerous, because a facecloth or toy can plug the drain and leave enough water for the child to drown in. Make sure rubber drain plugs are secured to the bathtub drain and are not small enough to cause a choking hazard. Place a non-skid mat in the bathtub. Keep the toilet lid closed. Children have drowned in toilets or received bumps and concussions from the toilet seat lid. Install safety latches on all cupboards and drawers. Lock away all poisonous substances, including medications, cosmetics, perfumes and mouth washes. Ensure all medications have child-resistant caps. Place a hook-and-eye latch on the outside of the bathroom door to keep a crawling baby out. Make very sure your child cannot lock the bathroom door from the inside, or ensure that you can unlock it from the outside. Use non-breakable cups, soap containers and toothbrush holders. Place a cover over the tub spout to avoid dripping hot water. Ensure you have locks on cupboards, drawers and medicine cabinet. With a clear shower curtain, you can still see baby, but her splashes are contained. Keep bath toys in plastic baskets with drainage holes. Keep a bench or chair near the tub for the supervising parent. Remember, no matter how childproof your home is, constant supervision is still required. It only takes a second for an accident to happen. 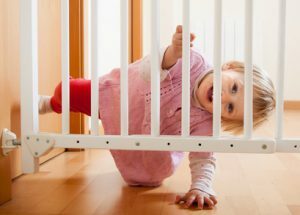 Read the full article on CanadianLiving.com for tips on childproofing the rest of your house.